One of the two main fighter aircraft equipping the RAF during the Battle of Britain. Technically, it was a single seater monoplane fighter, of stressed skin construction. The aircraft was originally designed by Reginald J Mitchell, who died in June 1937. A team led by Joseph Smith designed the variants. In 1936, before the first flight of the prototype, the Air Ministry placed an order for 310 Spitfires. However, in spite of the promises made by the Chairman of Vickers-Armstrongs (the parent company of Supermarine) that the company would be able to deliver Spitfire at a rate of five a week, it soon became clear that this would not happen. When other companies were able to start building Spitfire components there were continual delays because either parts provided to them would not fit, or the blueprints were inadequate; the sub-contractors themselves faced numerous problems building components which in many cases were more advanced and complicated than anything they had faced before. As a result of these problems the first production Spitfire K9788 was not delivered to the RAF until July 1938 with front line service starting in August 1938. For a time the future of the Spitfire was in serious doubt, with the Air Ministry suggesting that the programme be abandoned and that Supermarine change over to building the Bristol Beaufighter under licence. The managements of Supermarine and Vickers were eventually able to convince the Air Ministry that production would be sorted out and, in 1938, an order was placed with the Morris Motor Company for an additional 1,000 Spitfires to be built at huge new factory which was to be built at Castle Bromwich. This was followed in 1939 by an order for another 200 from Woolston and, only a few months later, another 450. This brought the total to 2,160, making it one of the largest orders in RAF history. The early Mk Is were powered by the 1,030hp engine driving an Aero-Products "Watts" 10 ft 8 in diameter two-blade wooden fixed-pitch propeller, weighing 83 lb. All Merlin I to III series engines relied on external electric power to start; a well known sight on RAF fighter airfields was the "trolley acc" (trolley accumulator) which was a set of powerful batteries which could be wheeled up to an aircraft. The lead from the "Trolley Acc" was plugged into a small recess on the starboard side cowling of the Spitfire. On Supermarine-built aircraft a small brass instruction plate was secured to the side cowling, just beneath the starboard exhausts. Early on in the Spitfire's life it was found that at altitudes above about 15,000 ft, condensation could freeze in the guns. The system of gun heating, described above, was introduced on the 61st production Mk I. At the outset of World War II, the flash-hiders on the gun muzzles were removed and the practice of sealing the gun ports with fabric patches was instituted. The patches kept the gun barrels free of dirt and debris and allowed the hot air to heat the guns more efficiently. Early production aircraft were fitted with a ring and bead gunsight, although provision had been made for a reflector sight to be fitted once one had been selected. In July 1938, the Barr and Stroud GM 2 was selected as the standard RAF reflector gunsight and was fitted to the Spitfire from late 1938. These first production Mk Is were able to reach a maximum speed of 362 mph at 18,500 ft, with a maximum rate of climb of 2,490 ft/min at 10,000 ft. The service ceiling (where the climb rate drops to 100 ft/min) was 31,900 ft.
From the 78th production airframe, the Aero Products propeller was replaced by a 350lb de Havilland 9 ft 8 in diameter, three-bladed, two-position, metal propeller, which greatly improved take-off performance, maximum speed and the service ceiling. From the 175th production aircraft, the Merlin Mk III, with a "universal" propeller shaft able to take a de Havilland or Rotol propeller, was fitted. Following complaints from pilots a new form of "blown" canopy was manufactured and started replacing the original "flat" version in early 1939. This canopy improved headroom and enabled better vision laterally, and to the rear. Late in 1940, a Martin-Baker designed quick-release mechanism began to be retroactively fitted to all Spitfires. The system employed unlocking pins, actuated by cables operated by the pilot pulling a small, red rubber ball mounted on the canopy arch. When freed, the canopy was taken away by the slipstream. Also in early 1939 the manual hand-pump for operating the undercarriage was replaced by a hydraulic system driven by a pump mounted in the engine bay. Before this change was made pilots had to pump the undercarriage up with their right hand while simultaneously trying to keep the Spitfire controlled using the left hand on the control column. This often led to a condition known as "Spitfire knuckle" where pilots skinned their hand on the side of the cockpit while pumping. Spitfire Is incorporating these modifications were able to achieve a maximum speed of 367 mph at 18,600 ft, with a maximum rate of climb of 2,150 ft/min at 10,000 ft. The service ceiling was 34,400 ft.
A voltage regulator was fitted in the bay directly behind the pilot. At first this was mounted low in the fuselage. Starting in the N30xx series the regulator was repositioned to the rear of the seat bulkhead, appearing low in the rear transparency. From N32xx, the regulator, which was under a black, cylindrical cover, was secured to the bulkhead directly behind the pilot's headrest. Other changes were made later in 1939 when a simplified design of pitot tube was introduced and the "rod" aerial mast was replaced by a streamlined, tapered design. Also, to improve protection for the pilot and fuel tanks, a thick, laminated glass, bulletproof plate was fitted to the curved, one piece windscreen and a 3 mm thick cover of light alloy was fitted over the top of the two fuel tanks. From about mid-1940, 73lb of armoured steel plating was provided in the form of head and back protection on the seat bulkhead and covering the forward face of the glycol header tank. In addition, the lower petrol tank was fitted with a fire resistant covering called "Linatex", which was later replaced with a layer of self-sealing rubber. In June 1940 de Havilland began manufacturing a kit to convert their two pitch propeller unit to a constant speed propeller. Although this propeller was a great deal heavier than the earlier types (500lb compared with 350lb) it provided another substantial improvement in take-off distance and climb rate. 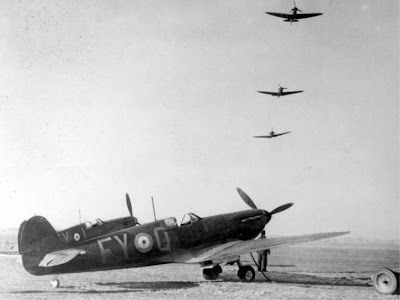 Starting on 24 June de Havilland engineers began fitting all Spitfires with these units and by 16 August every Spitfire and Hurricane had been modified. "Two step" rudder pedals were fitted to all frontline Spitfires; these allowed the pilot to lift his feet and legs higher during combat, improving his "blackout" threshold and allowing him to pull tighter sustained turns. Another modification was the small rear view mirror which was added to the top of the windscreen: an early "shrouded" style was later replaced by a simplified, rectangular, adjustable type.